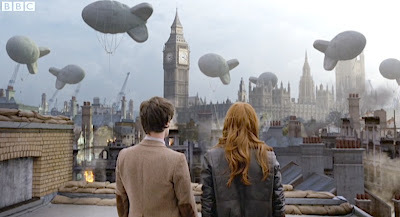 As the Doctor and Amy stand in awe of the Blitzed London cityscape before them, the Doctor utters the word 'history'. It's often contentious how the series uses history and the well known historical figures within it. Victory Of The Daleks makes another bid for 'quality television' status in the way it tries to faithfully recreate the London and Cabinet War Rooms of the Blitz and uses Winston Churchill as a 'sign' of British heritage within the series. At the same time it tries to tell a story about the Daleks which hyperbolises the 'Nazi mythologising' of their race within the World War 2 setting but also offers a 'restoration' of the Daleks that concludes, by returning to a kind of Dalek Year Zero, the entire Time War phase of their history and offers a questionable revisioning of a 1960s design icon. 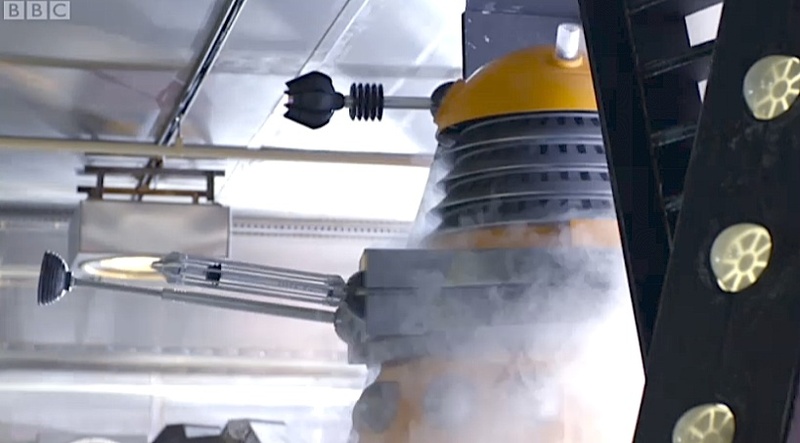 This restoration includes some radical design decisions that change the established classic silhouette of the Daleks, altering their iconic expression of 1960s modernity, where their streamlining echoes an amalgamation of influences, evoking that decade's distinctive progress in domestic, consumer and industrial product design and incorporating the futurism of the then new Atomic Age, both aesthetically and philosophically. What now emerges is a bulky, brightly coloured 'Vorsprung durch Technik' that clearly acknowledges the pop-art Daleks of the Cushing movies and 1970s German car design (think Volkswagen Beetle on steroids) but that also seems to echo the unflattering commercial wardrobe of the Power Rangers. I understand the desire for change and don't dispute that some of the design decisions have a perfectly reasonable rationale (removing the rivets that perhaps denote a human hand in their making) but the results look clunky, particularly from the rear, are less streamlined, quite top heavy and If they are meant to be more threatening then I think the primary colours don't necessarily do them any favours. Design is subjective and, divisive as these new designs are, I'm sure someone out there actually loves them. Personally, I don't. The new Dalek design is the least of Victory Of The Daleks problems. Whilst it's an entertaining episode it is by the far the weakest of the series so far and after all the hype, including those Radio Times covers that revealed in advance the one big juicy spoiler of the episode - the new Daleks, it is actually quite disappointing. Once the new Daleks are revealed, there is a sense of expectation still remaining as the story draws to a conclusion where we wait for one more surprise that never comes. Instead, five Daleks stand around a rather empty looking spaceship, barely moving, not hovering or flying out into space to go one on one with Spitfires, and then they do a Millennium Falcon and disappear. The episode feels very much as if it should have been the first half of a much bigger story. It has a very economic running time, rushing through a series of slightly dislocated set pieces, visually pleasing but not very emotionally engaging. Although the World War 2 background and Churchill character are well realised nostalgic bits of window dressing they are not entirely central to the success of the story and Gatiss could well have extended this by an episode, perhaps moving the story on to a confrontation away from the Earth. It might have helped generate a genuine sense of threat out of what is a very convoluted scheme to give the Daleks a new paint job. It's an odd episode, with a strange tone that emerges from an uncomfortably parodic 'stiff upper lip' 'chocks away' portrayal of the British servicemen and a very unsubtle caricature of Winston Churchill, provided by the normally reliable Ian McNeice. 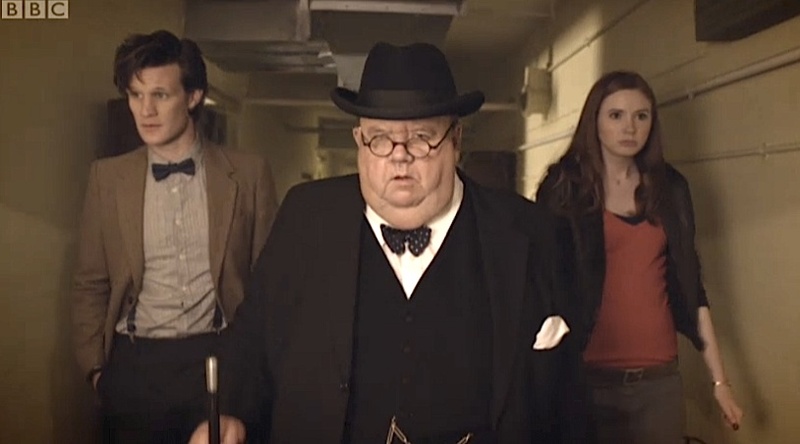 The opening 15 minutes are terrific because the interaction between the Daleks, Churchill and the Doctor works very well and the vision of Daleks prowling round the War Rooms, serving tea and doing the filing whilst craftily keeping an eye on the Doctor, bring back happy memories of the scheming pepperpots from The Power Of The Daleks. It all goes to buggery with the activation of the Progenitor (and who knows where that came from) and the nonsensical scheme to use Bracewell to bring the Doctor to them to confirm he's their arch-enemy. 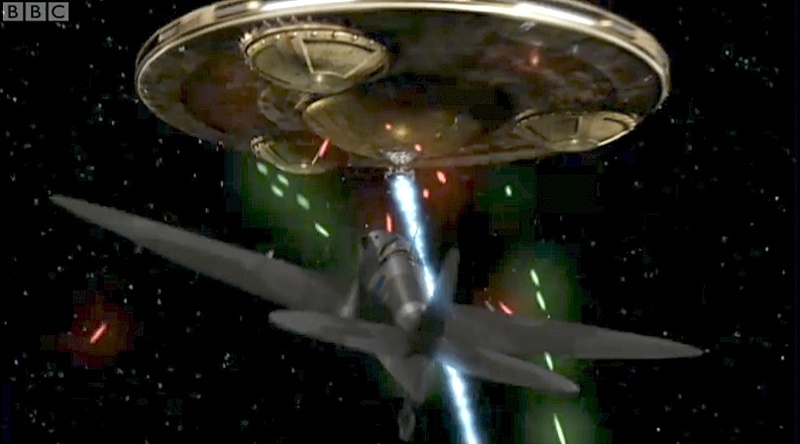 As soon as the Doctor heads to the Dalek saucer, the World War 2 setting just becomes cultural tourism and the episode becomes more concerned with pimping up the Daleks and dogfights in space. Although there are efforts made to show the effect of the war on those serving in it with the pre-titles momentarily depicting a worried servicewoman, Breen (little nod to Quatermass there from Gattis) and then the episode picking up her character again briefly to mention that she's lost someone in the battle, I found it very hard to connect emotionally with her plight and the consequences of the story's use of history. We are shown or told about the Blitz at a distance, amidst Churchill's constant re-stating of the high stakes, and connections to personal stories are kept to a bare minimum. It would have been interesting to see characters in air raid shelters or in the Underground to give us a real sense of what was at stake. There is talk of incendiary bombs and strikes but we never see them or the aftermath as much as we see the air-raids in The Empty Child. In Dalek, which successfully set out to re-establish the threat of Skaro's finest in the face of all the 'stairs' jokes we'd heard as a repeated meme over the years, the Doctor's role in the story, and his emotional connection to the Daleks, is propelled by survivor's guilt. His anger and xenophobia is also countered by Rose's humanity. The Doctor's connection here is to inadvertently provide the catalyst for their resurrection. Amy, who doesn't get a great deal to do here, only really engages us when she and the Doctor are trying to deactivate Edwin Bracewell. 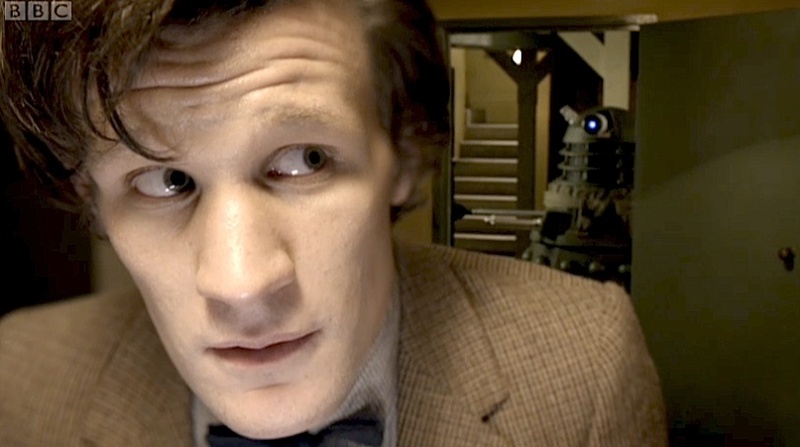 It's Amy's role to relate to Edwin on a human level, thus highlighting the human factor that's currently missing from the Doctor's view of the world. This emotional dimension is welcome in a story that for much of its running time oddly doesn't succeed in providing one and also doesn't make the new Daleks a force to be reckoned with. This is, I think, a symptom of the 'shopping list' commissioning procedure that Gatiss was provided with. A simple brief of 'Churchill, the Blitz, Daleks' but the historical backdrop and the use of Churchill are simply history as 'clip art', as pageant and pastiche, to frame, and perhaps clumsily comment on, the problems facing Doctor Who's two great political forces - the British Empire/Doctor and the Third Reich/Dalek Empire - both fighting to survive, both attempting to hold an Empire together. The nostalgic view of British identity here is something that the new series seems particularly driven by, with both The Eleventh Hour set in the pastoral of an English village and The Beast Below offering a retro 1950s Orwellian future. It is a continuing narrative about our island identity (including Scotland it seems) that Moffat desires to uphold even though this is more a mythical construct than realist vision. The version of that myth presented here could have been further strengthened if Gatiss had been able to tease out more of the cultural differences between the two Empires, and by extension the real threat of one to the other, instead of relying on a familiar vision of wartime that was itself a propagandist construction of the concensus-creating processes of cinema, radio, Pathe News and Picture Post. The episode gets a little too bogged down in jingoism and a romanticised cod-patriotic view of the war. These are stereotypical images reinforced through countless British war movies, particularly the ones pastiched here, such as The Dam Busters, 633 Squadron and Where Eagles Dare ('Broadsword to Dannyboy'). We mustn't forget that all these stereotypes actively promote a certain vision of World War 2 and the home front that contentiously becomes a reinforcement of the 'Dunkirk spirit' and of national social solidarity. Here, Churchill sees a vision of Wren's churches in flames and this fits exactly with a mythologising of Britain and British culture within the series that's been there since the 2005 revival where the episode's space battle re-enactment of the Battle Of Britain takes place over the London of Shakespeare and Dickens. Churchill himself is a construction too, the familiar public persona used here is one he no doubt helped to create and one he encouraged himself, and he has always been perceived in popular culture as a mixture of traditional stereotype, patriotism and a symbol of national unity. McNeice overplays it and it's hard to find the man's humanity in there amongst the jowls, the cigars and the stylised speeches and that's a great pity because a chance to see beneath the symbol would have added an interesting dimension to his portrayal. In opposition to this popular image of British collectivism during the height of the Blitz we have the 'restoration' of the Daleks. Their 'tonight Matthew I'm going to be Strategist, Scientist, Drone, Supreme and Eternal' unveiling in a waft of dry ice suggests the new Daleks are again highly symbolic of the purist Nazi monoculture that sought to consume or destroy anything aberrant, or 'other', including non-purist Daleks, and they continue to represent tyranny in opposition to freedom, persecution in opposition to tolerance, with the confrontation between the Doctor and the Daleks subtly reinforcing that continuing Anglo-German rivalry that is in itself a re-enactment of the Second World War. Beyond this, there is still a captivating performance from Matt Smith to savour, whose physicality is a pure delight and who manages to deliver a number of lines that could easily have been lost on the page. 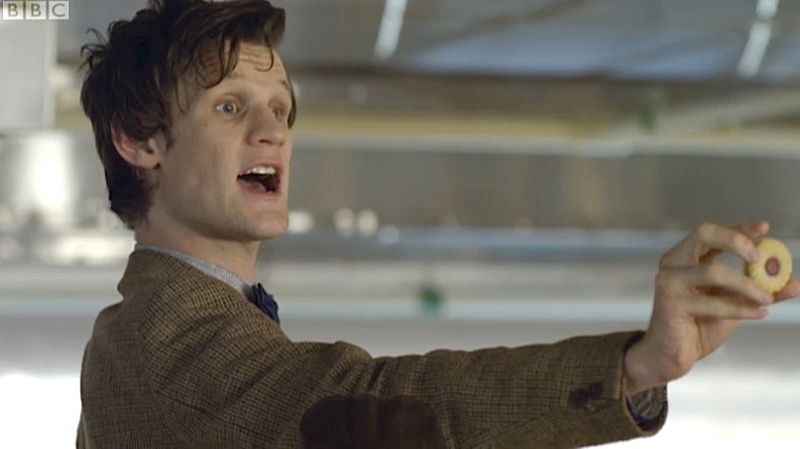 The TARDIS destruct button bluff ('Don't mess with me, sweetheart') with the Jammie Dodger (their sales will rocket on the basis of this) is wonderfully played and his anger in trying to get a reaction from the camouflaged Daleks is great. He holds all of this together and is now clearly the greatest asset this series has at its disposal. Karen Gillan doesn't really get an awful lot to do until she has to talk Bracewell out of self-destructing and there is therefore a distinct lack of chemistry between her and Smith that the episode sorely needs. Again, what she does get given to do she does very well. 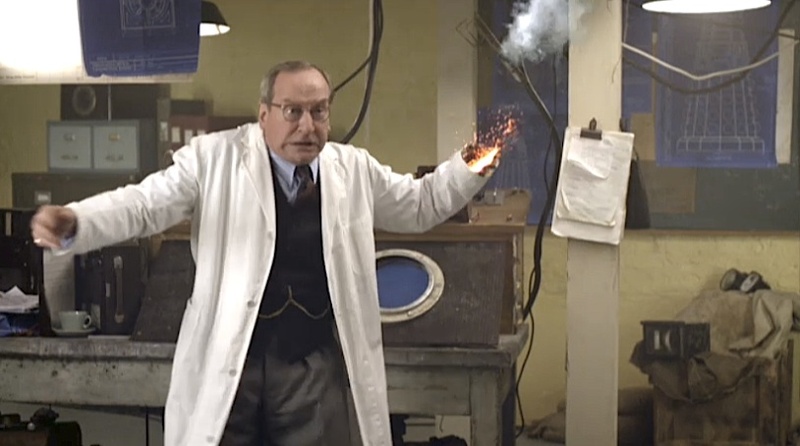 Bill Paterson is good as Bracewell, managing to convey well the confusion at discovering his non-human origins and the conflict between machine intelligence and human emotion. But then there is that really unnecessary scene at the end which seems to go on forever with the Doctor and Amy prattling on to Bracewell. Their suggestion that he go off and have a wonderful life with Dorabella could have been reduced to a couple of lines. What's also clear here is that the budget has gone on two major sets, the War Rooms and the Dalek Saucer interior, and building the new Daleks (which also suggests they will want to recoup their costs by featuring this lot again). Sadly, no amount of set dressing and dry ice can hide the fact that the Dalek saucer looks like a vacant factory floor somewhere in Wales. Andrew Gunn's direction is, at times, very cinematic. The shots of the Doctor looking over his shoulder as the Daleks prowl the War Rooms are beautiful examples of the deep focus cinematography the series has now embraced but he really needed to get some good movement into those new Daleks even though he tries hard to shoot them from various angles and distances. The trouble is that no amount of good lighting and shooting can resolve the very unflattering side on or rear view of the props. Visual effects are excellent, especially the Spitfire versus Dalek saucer battle and the views of London in the Blitz. Murray Gold's music has a suitably rousing Eric Coates and Ron Goodwin feel to it considering the borrowing from the British war film genre. 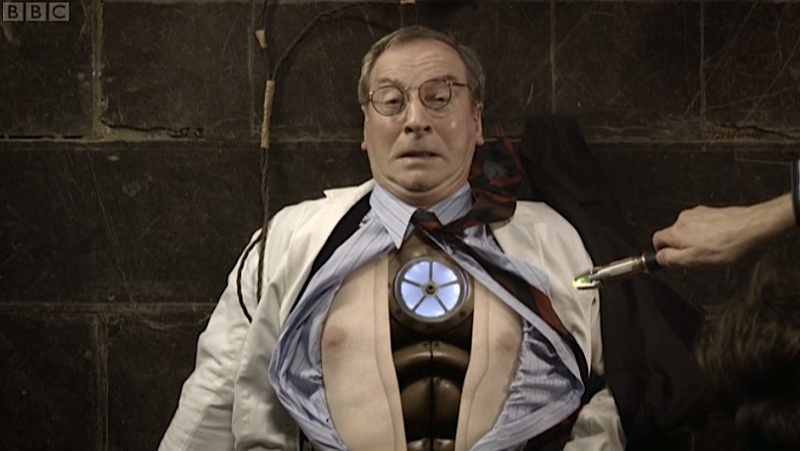 So, the episode is not entirely a success and I would say it is very much a Pyrrhic Victory when it comes to redesigning one of the major icons of the series and reintroducing them to the Doctor. As controversial as the buggering with the theme music, the titles and the TARDIS interior. In the end, we are left only to ruminate on the intriguing mystery of why Amy doesn't know about the Daleks and a reminder of that crack in the universe as the TARDIS dematerialises. Im starting to have the feeling that mr. Moffat was great as a writer but he isnt much worthy when he is given a higher responsability. This chapter was almost lame in many senses. Whats the most ridiculous way to dismantle a android-bomb? With love and nice intentions!! Or in the time that Doctor have a brief talk with the Daleks this guy manage to have a TV link with the spaceship and to prepare not 1 but 3 planes to fly and destroy the Death Star... The explanation of Daleks survival? One ship escaped... Seriously? Thats the best you can do?? For God shake, that if i dont see some negative reaction against all this, we really deserve that iDaleks. Well, I thoroughly enjoyed the episode. Full of action and adventure. It could have done with more time with the spitfires in space than convincing an android it's human (I'm still not sure how that stopped it/him from exploding) but I guess the SFX budget wasn't up to it. I actually thought Matt Smith was a bit weak in this one and was not that convinced of his Doctor's hatred of the daleks. And, of course, the iDaleks will feature again (probably far too many times!). This episode was just a set-up to bring them back and give them a paint job. I never thought I'd be nostalgic for the RTD era. This was horrific, a death knell if ever there was one. 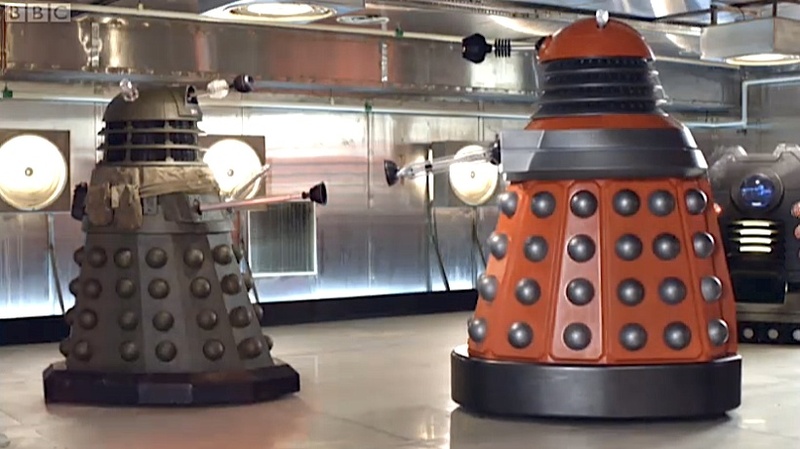 The Daleks look ridiculous - they look like Fat Bastards, ala Austin Powers. I was concerned after mess of The Beast Below - now I'm agape at how Moffat is making a pig's breakfast of things. And this from the man who gave us Press Gang (one of the most sublime series ever made) and Blink. I don't mind a redesign as such, but at least do something decent. The colours are fine in and of themselves, but up against the young cast, the comedy Churchill, and total lack of plot, it's dragging things firmly into the Chuckle Brothers direction. The new daleks are dire. I think we need to protest & insist they are changed to something less human built looking. RTD was ok, I hoped the Moff was better, but it appears not. Is this so they can cancel the show?